Ships from and sold by 4Wheel Online. 5.0 out of 5 starsCool little battery charge/discharge relay, much better than the old diode isolators. Installed recently, so far so good, super-solid build quality. 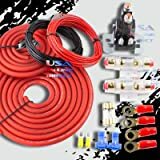 use to connect a house battery (with connected solar module) to engine battery so either can pass power back and forth. 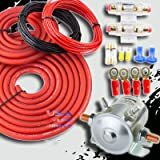 The unit is very simple with two main power lugs (one for each 12V battery) a spade lug for ground sensing (required) another lug for start bypass (optional) (disconnects the house battery during engine start) and a lugs for an optional remote 12V LED status indicator (unit has integrated LED indicator). Premise of operation: Unit connects battery sources together if one *or* the other have a higher voltage (its a relay so when connected both batteries are wired together) Example, I have the engine battery and alternator and a house battery with solar, I want the alternator to charge the starting and house battery but not allow house loads to pull from the starting battery when engine is off (typical configuration) however, I also have a solar PV module that produces surplus power so charging the starting battery with excess power is preferred. 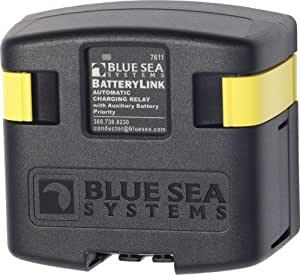 So the house battery connects to one terminal, the start battery to the other, if the engines running the start and house battery link, if the engine is off the start battery is disconnected from the house battery *unless* the solar output pushes the house battery voltage above 12.8v, then the relay will close and link both batteries. Once the sun goes down, the relay opens separating the batteries again. 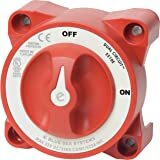 Blue Sea makes some great electrical products and I really like this isolator. 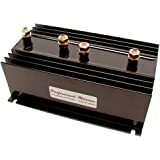 It's a solid state and doesn't require any manual switching when isolating or combining batteries. I had a Battery Doctor one that worked well, but I over-tightened one of the nuts on the terminals and damaged it. 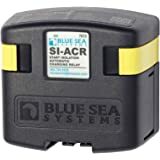 I bought this for my 2004 Tacoma 3.4L to combine and isolate my Optima Yellow Top (auxiliary) battery and Sure Start AGM (primary starting) battery. 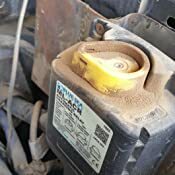 The isolator is supposed to only be 45 amps max I think, and the charging system in my Tacoma is 80 amps but I have not had any issues so far. UPDATE: the ML-ACR and switch were not functional! I was first annoyed that they arrived in used condition then I was even MORE annoyed and angry when I was troubleshooting it because it was not functioning as it should have been. 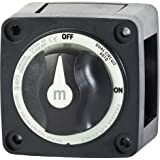 I have a meter and I was testing everything and all signed pointed back to the ML-ACR not functioning properly (the switch also would not even light up), so I had to return it. 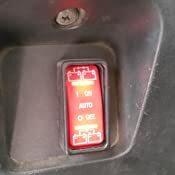 *The ML-ACR I purchased as a replacement from another vendor was installed and the switch was installed (with the SAME wiring that the used one i bought off here had) and it functioned FLAWLESSLY IMMEDIATELY!!!! You can gamble if you feel like your potentially wasted time is worth the minute cost savings but I will not be doing that again. This was more a waste of my money, it was a waste of my time which I cannot get back. I am very unhappy with this. It ruined a perfectly good afternoon, then I bought from another vendor anyway to avoid this issue again. My ML-ACR arrived and when i took it out of the package i noticed it looked used, the wiring pigtails had solder already on them and some electrical tape residue. The back of the ML-ACR had tape residue on it as well as if someone used doublestick tape to mount it the first time. I am overall not happy that it seems i got a used product. I was in a hurry for my purposes and could not wait to get another one so I didnt mess with the return policy but I am still unhappy about it. YMMV. 5.0 out of 5 starsThank God I heard about this unit before I replaced my failed isolator! This device is utterly fantastic. 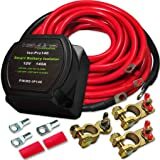 Ridiculously easy to install, eliminates the .5V-.7V voltage drop inherent in the old isolator that it replaced, and now not only can my alternator fully charge both the start and house batteries, but the charger hooked up to my house bank also seamlessly charges my start battery to boot! 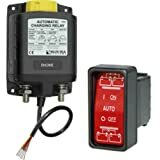 I would like to add that if you are retrofitting this device on an older RV that also has one of the old style fixed low voltage charging/dirty DC providing converter/chargers, like the Magnatek/Parallax 6300-7300 and others, replace it with one of the applicable Progressive Dynamic 4 stage chargers; it's an easy slide in mod and fully brings your DC system into the modern world! 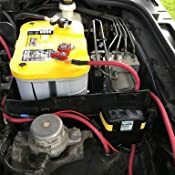 we used this in several of our overland dual battery installs. 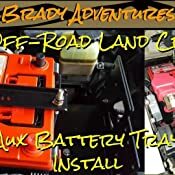 You can check out the installation by searching "brady adventures dual battery" on youtube. 5.0 out of 5 starsBullet proof dual battery system. 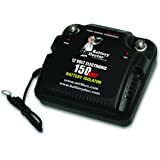 By far the best dual battery controller I have found. It is bullet proof and works automatically or manually, just hit the switch. I have it mounted in a Toyota Tacoma with a couple of group 31 platinums. This system is going strong over a year later.